The 1976 Russian Collection is perhaps one of Yves Saint Laurent’s most renowned collections. Drawing international inspiration from the traditional Russian and Balkan cultures, YSL constructed an unforgettable display of color, drama, and globalism through his reimagined designs. Hailing from that collection, this ankle-length skirt is done in a regal purple silk taffeta. The waist of the skirt is formed with a sash that moves into a yoke made from luxurious black velvet. Attached, the taffeta is finely gathered adding volume, and visual dimension to the skirt in contrast of the deep velvet panel. The balance between color and texture allow for a certain grandness about this design. While the ruffles at the hem create a peasant aesthetic, the thick sash that can be tied loosely or in a bow introduces a more upscale feel. Measurements: Size 34 Unlined, this skirt closes at the side with a concealed zip. 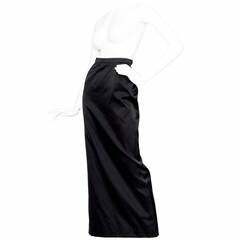 In excellent condition, this iconic YSL skirt has been professionally eco dry cleaned and pressed. High-quality vintage pieces like this are yours to live in and love while increasing in value every year. It’s never too soon to start collecting them, as an investment in your wardrobe—and in yourself.